Joe Blake was born in the small, southwestern Minnesota town of Madison, and was taught to love and respect the outdoors from a very early age by his father Dennis (Doc) Blake and his older brother Jim. Instilled with the belief that honesty, integrity and ethics were of high priority in all endeavors it was only natural that Joe found his way into bow hunting. At a young age a copy of Fred Bear’s Archer’s Bible whetted a boy’s appetite and allowance and odd-job monies were saved for Joe’s first bow, a 45# Ben Pearson recurve, purchased at age 11. Countless hours were spent roving, bowfishing, and small game hunting in and around the wooded lakeshore where Joe grew up, and soon a Herter’s takedown joined the arsenal and it was time to hunt big game. Success was elusive for several years, partly due to commitments as a standout, three-sport athlete and partly due to Joe’s equal loves of fishing, trapping, and bird hunting. After a time the young boy became a man and realized that to be successful at bowhunting more time needed to be devoted, so guns and traps were sold and fishing was put on a back burner to devote all his energy to hunting with bow and arrow. In 1988 Joe began pursuing a lifelong dream of becoming an outdoor writer, and sold the first two articles he ever wrote to Archery World magazine and Bowhunter Magazine respectively. And in the nearly three decades since there have been well over two hundred feature articles, columns, and short stories published in virtually every major bow hunting magazine and many “mainstream” outdoor publications as well. In 1993 he was given a Staff Contributor position at Bowhunter Magazine, and followed that up a few years later by being named the “Stickbows” Editor at Bow & Arrow Hunting. In 2009 Joe was made ‘Hunting Editor’ for TradArcher’s World Magazine. 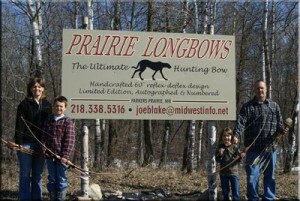 Because of his writing success and positions with major magazines, Joe was privileged to be able to hunt with and promote a number of traditional bows for other bowyers, but trouble with the last couple contracts led to a new door being opened: good friend and bow shop owner Greg Sovde of G&M Archery was the first to suggest that Joe “eliminate the middle man” and build his own bows. And so, Prairie Longbows was born in 2004. Realizing that bow building was a major undertaking, and not wanted his fledgling career as a bowyer to take time away from either his career as a bow hunting writer or from actual bow hunting time itself, Joe’s major concern was getting too busy with bow orders, and it was actually another friend, Stephen Lathrop from Illinois, that suggested building a limited edition, autographed and numbered signature bow. Thus, the Prairie Panther was born. Today Joe lives on a wooded Minnesota hobby farm with his wife Kim, their son Ryan, and their daughter Megan. His bow shop is a short walk out the back door and another short walk leads to a private 3-D course where each Prairie Longbow is tested and perfected in the field, right where a hunting bow belongs. Joe, Kim, Ryan, and Megan all shoot Prairie Longbows … maybe you should give them a try too!